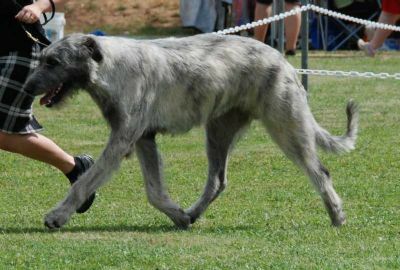 After winning Irish Wolfhound Rising star and Irish Wolfhound All Breeds of the Year 2009 Grand Ch Ornumflow Hagan (Dudley) has continued his winning ways to culminate in achieving his Grand Champion Title in 2011. He is a well muscled young dog with outstanding temperament and achieved multiple BIS, RUBIS, BIG and countless classes in group along the way to his Grand Champion Title. We are also very proud of Dudley's Irish Wolfhound Club and Special Club Pointscore wins taking out Best Up and Coming for 2009 in the IW Club Pointscore, the Pines Trophy for Best of Type under 2 years at our Easter and October Irish Wolfhound Club Specialty show. Dudley is also the winner of back to back -All Breeds IW DOL Competition 2009 and 2010. At Ornumflow we are very proud to have Tara campaigning him so well and congratulate her on his many wins and especially of campaigning him through to Grand Champion status.